In the fifth pAsuram, AzhwAr says “Your beauty remains in my heart constantly reminding me [about it] and tormenting me; you should tell me a way to forget it”. ellaiyil sIr iLa nAyiRu iraNdu pOl ennuLLavA! mallai gyAlamuzhudhuNda mAnIrk koNdal vaNNanE! vaNNanE – oh one who is having the form! Oh one who is having a form which is like a dark cloud filled with water, who fully placed the big universe surrounded by ocean, in your stomach! I who am enslaved by you cannot express in words [the reason why you are shining in me]; your divine feet having shining radiance remained in me like two youthful suns having boundless beauty; what means is there to attain the darkness to be said as sorrow? While the divine feet are shining, since AzhwAr does not get to enjoy them physically, he prefers forgetting them. Since, the previous pAsurams and the subsequent pAsurams in this decad reveal his sorrow, this pAsuram should also be seen in this context only. solla mAttEn – I cannot express in words the manner in which you remain in my heart and torment me. adiyEn – Due to our relationship [you being the master and I being the servitor] I cannot avoid you. un thuLangu … – What is that [I cannot avoid]? Your divine feet with shining radiance. ellai … – They are tormenting me by remaining in my heart like two youthful suns with boundless beauty. Here they are said to be youthful suns, since they can be seen without straining the eyes, and they are in the starting stage of their tormenting. iLa nAyiRu – As they torment me, their youthfulness keep increasing. allal … – bhattar would mercifully explain “When you hide yourself and make it difficult for me to see you, worldly people will ignorantly say ‘he is inferior’; how can I get such ignorance?”, since AzhwAr would want to forget emperumAn and survive. ammAL would explain it as “While the divine feet are shining in my heart, is there any means to acquire ignorance which leads to sorrow?” If there is such an option, I can also be engaged in worldly matters like the worldly people. Azhi … – Oh great benefactor who placed the great universe surrounded by the ocean, in your stomach and protected it from the deluge! AzhwAr is saying “emperumAn is having a form which resembles a cloud which absorbed a huge singular ocean”. 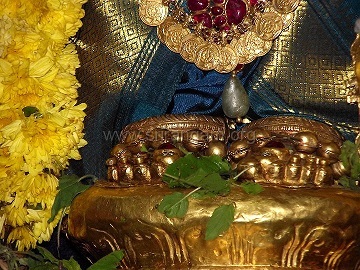 This entry was posted in thiruvAimozhi, thiruvAimozhi 8th centum on March 22, 2019 by Sarathy Thothathri.